This method is not a new trick or hack to crack or bypass Windows Vista activation requirement which has been made harder to crack by Microsoft. 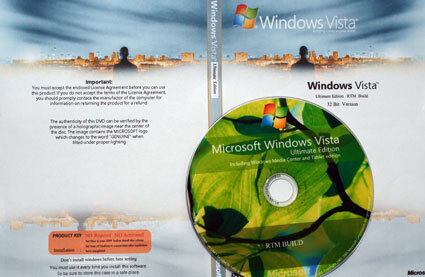 The steps to install Windows Vista in future date has previously been published. However the method is again made famous by the release of pirated Windows Vista retail DVD in Thailand. The illegal copies of Windows Vista Ultimate is sold only for $5.00 or less in high scale shopping mall in Bangkok, compared with official retail price at $400, with the DVD contains fully functional RTM final release, virus-free version of Windows Vista which is same as Vista downloaded from P2P network, and can be used to install Vista Basic, Vista Premium, Vista Business or Vista Ultimate. According to the Windows Vista pirated DVD, Windows Vista activation can be bypassed and cracked by installing Windows Vista in future date as detailed in the guide below. There is no product key needed. Purchase your Windows Vista DVD or download MSDN release version of Windows Vista. If you download Windows Vista RTM Build 6000 ISO, burn it to DVD. Disconnect or disable Internet connection or simply unplug the cable. Set the date to year 2099 in the BIOS (or whatever the maximum year the the BIOS capable to set). Check your computer manual on how to access BIOS and change date, normally pressing F2, F10 or Esc will do. Boot from Windows Vista DVD. When install Windows Vista, do not enter any product key or serial number. Simply leave the field blank and click Next. When prompted for confirmation, click ‘No’. Once Windows Vista finishes installing, set back the date to the current time in the Windows Vista desktop. The simple hack for the pirated DVD of Windows Vista ends here. However, there are a more comprehensive method to crack Windows Vista activation that immediately follows the tutorial steps above (skip the above time changing step). When Vista installation is finished, boot up Windows Vista and go to the Windows where you’ll required to enter desired account name and password, followed by computer name. Do not enter anything yet, instead press Shift + F10 key together to launch Command Prompt. In the launched Command Prompt, type “taskmgr” (without the quotes) to launch Task Manager. In the Task Manager window, go to Processes tab, and locate the program called “msoobe.exe”. Select the process and click on “End Process” button to terminate the program. The Account Creation screen should disappear and the Welcome Screen should appear. Log with a user called “Other User” and then click the arrow button in the right corner, and then click on “Restart” to restart the system. Upon initial stage of system bootup after restarting, press F8 Key to go to Safe Mode. In the Safe Mode, go to Start -> Run, and type “control userpasswords2” (without quotes), and the user accounts setting should appear. Go to Advanced tab, and in Advanced User Management section click on Advanced. There will be two folders named Users & Groups. Double click on Users folder then right click on the icon named Administrator, and then unchecked the setting that says “Account Is Disabled”. Click on OK twice to exit. And don’t restart the computer. In the clock and time shown in the Notification Area (System Tray), right click on the Clock and select Adjust Date and Time. Go to Internet Time tab, and choose Change Settings, then uncheck (untick) Synchronize with an Internet Time Server option. Restart the computer and boot up to BIOS. Reset the computer date and year to current year. Boot up the computer to Windows Vista, you should be able to log on as Administrator. Go to Start -> Run, and type “winver”, then press Enter or click OK.
A window will display and mentioned that the product is licensed to: Windows User. Beside, in My Computer properties, the computer name will have a randomized name too. In Windows Explorer, go to Folder Options, and select Show Hidden Files and Folders settings. Locate and Run msoobe.exe by double clicking on it. Input the desired account name, computer name, date and the time zone. Windows Vista will then analyze the computer’s performance. Wait for the performance check to complete. Once performance check is complete, go to Start -> Run, and type “control userpasswords2”. User Accounts window will be launched. Go to Advance, and in Advanced User Management section click on Advanced, and then double click on Users folder. Right click on Administrator and then select Properties, and check the Account is Disabled option. There are hack that combined future date trick above with activation files crack as detailed in the last part of this article. All tricks will extend the length of time or the grace period that requires to activate Windows Vista, by fooling Windows into thinking that the timeout is far into the future. In other word, the Vista is running in trial demo mode which made available by Microsoft. Whichever bypass or crack method you choose, it’s unclear how long the activation will last, as the main pillar of Software Protection Platform (SPP) on Windows Vista, Windows Genuine Advantage (WGA) hasn’t come into picture and play its part when Vista users check for software updates. Find out method to permanently activate Windows Vista with TimerStop process, or remove your KB929391 if you get caught by Microsoft.